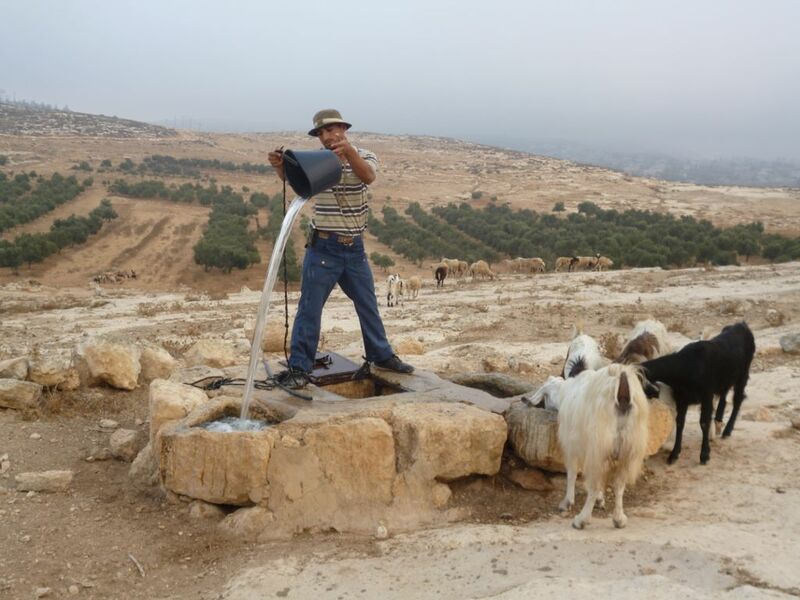 Sally is a Melbournian currently on placement with the World Council of Churches Ecumenical Accompaniment Program in Palestine Israel (EAPPI)) based in the the South Hebron Hills of the West Bank. A key focus of the work of EAPPI is protective accompaniment, to protect people and their property from violence. Here are two of her recent emails back home which she has generously agreed to share. Photos supplied by Sally Masters (except one of broken olive tree). For more stories, please see the EAPPI blog. 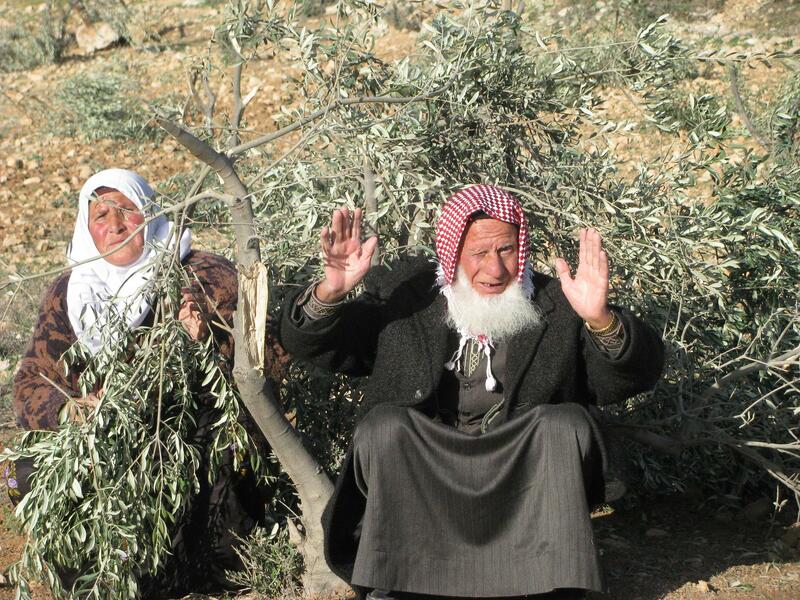 Palestinian people love their olive trees. In the village everyone would have at least a few trees that they use for their own olive oil, pickling or selling. Most families would have an Olive grove somewhere and they would know who in the family had planted the trees some, honestly, centuries ago. Olive trees form part of their history, the trees are part of their wealth and pride. They usually water their trees each week. Last weekend we visited the village of At Tuwani this is an area of very productive land, mostly the people have flocks of sheep and olive trees. Our host Musahb Al Amour was a young man in his mid-twenties; in his home live 28 people – his mother, sister, 4 brothers and their wives and children. It is a traditional flat roofed home and we sat on the roof in the sun drinking sweet tea (as we would) and eating beautiful grapes. It was not long before the conversation turned to the olive crop. This year is expected to be a bumper crop after several less favorable seasons. 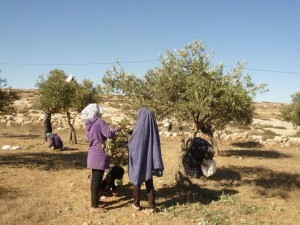 He was in fear though as the nearby settlers had in the past vandalized the trees just when the olives were due to be harvested. 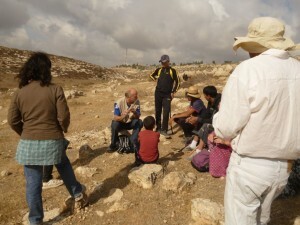 I remembered that the previous Saturday when Ta’ayush (the Jewish activists) were present in the village they told me just how aggressive the settlers are in this village and surrounding lands and because of this they regularly monitor the area. Operation DOVE have their house there too and spend half of their time walking the children to school which is right there in the village – this is essential every day as if there is no accompanier the children are beaten up by the settlers. This is often witnessed by the army but there is no consequence. The rest of the time they go with the shepherds in the fields. Ta’ayush told me that 10 years ago and illegal outpost called Mitzeeyair was set up by the settlers, now they have extensive organic green houses and are very successful farming this land. They have a lot of influence with the mayor and there have been ongoing court decisions and appeals as the fields belong to the Palestinians but this is not implemented. There is another nearby settlement called Habit Mo’an. Anyway our host continued to tell of his fear as he explained that just through the trees (a plantation of fir like trees), there were 21 settler families –last year they cut and damaged 200 olive trees. On another occasion an entire Olive crop was stolen when it was picked during the night before they were to harvest. 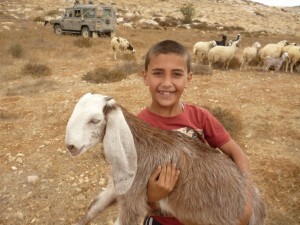 The shepherds experience difficulties on a daily basis. It was all pretty amazing. That night as feared there was an incident, it was discovered on the Sunday morning (which in these parts is a work day) that 10 Olive trees had all their olive laden branches sawn off. We attended to take photos and hear the story, the Palestinian media were there and apparently we three EA’s who attended appeared on TV that night as international support – we didn’t know since we don’t have a TV. Then again on Tuesday mid-afternoon we received notification that another 4 trees had their branches sawn off. Quickly we hurried to the village and out to the Olive grove to see the damage. On this occasion Musahb our host from Saturday had quickly got his video out when he saw the vandalism occurring and managed to record a very clear account of the branches being sawn. The culprit could be easily seen as a result the police attended – they often don’t. Also the Israeli Defense Force was there all with machine guns. Some took photos. They took a copy of the video and informed the owner that it was very clear and asked which direction the offender had run. We will wait to hear what will happen. When an Olive tree is damaged like that it is not just the crop of that season that is lost. It takes 5-6 years for the tree to recover adequately before it produces a crop again so the financial loss is really significant. 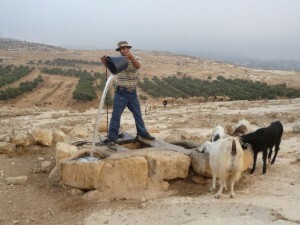 This morning we left early for Umm Al Ahmad to walk with the shepherds. It was much cooler today and the light is dim as we leave. We were expecting the morning to be fairly quiet as at present it is the Jewish holiday Sukkot. Four people from Ta’ayush, we two EA’s, five shepherds and two dogs set off. One shepherd opens the gate of his sheep pen and they hurry out– the other shepherds follow with their flocks. There are about 130 sheep and goats altogether. 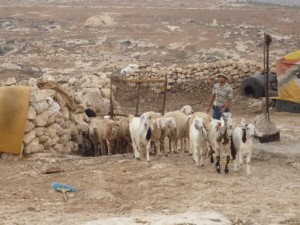 We head up to the cistern and a shepherd drops and bucket into the well four times in all and the animals gather to drink. Soon we are climbing over the dry rocky ground towards the valley past the family olive grove. The hooves of the sheep can be heard softly pounding on the dry, rocky earth and the tinkle of bells is clear this early in the morning. Across the hills an illegal settlement can be seen and as we round the hill we see the Israeli army vehicles waiting ready for us! The settlement is illegal as it has been built on occupied territory as the 4th Geneva Convention, article 49 states that an occupying force cannot build permanent dwellings or move their population into such an area. 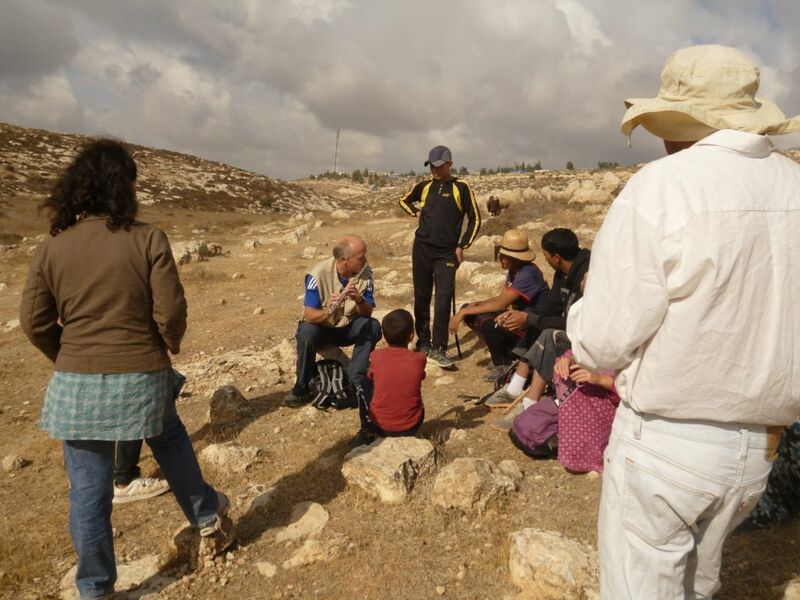 The valley is also area C and although the shepherds own this and are entitled to graze on this land they only do so on a Saturday when an international volunteer or Ta’ayush can be present due to the settlers’ aggression previously experienced. 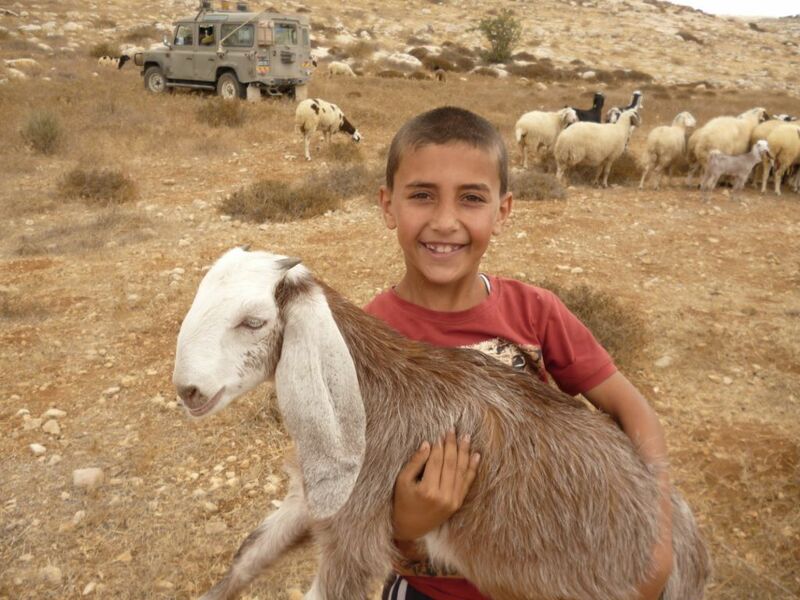 The shepherds are just too scared, 2 of them are just 16 years old and the settlers carry guns – Israeli law allows settlers to do so. The sheep eat hungrily, it is important for them to graze this area when possible as it “rests” the other pasture and stretches the fodder they have saved from the summer harvest. As we all walk along, the soldiers get out of their vehicles, four from each, with the flashing lights; they wear their machine guns like hand bags slung over their shoulders. As we move past through the valley the army vehicle comes from behind guarding us so that we must go right close to them. Soon the sheep have found their spot and cluster to graze, we volunteers stand close to the sheep or some sit on rocks to chat and share stories. One Ta’ayush woman had not been hired in her line of work as she had not done her National service as she disagreed with the regime, another was self-employed so no one ever asked her if she did her service, still another had been arrested only yesterday and was still shaken- apparently he stood too close to an Israeli settlement, he was released though as he was Israeli himself. 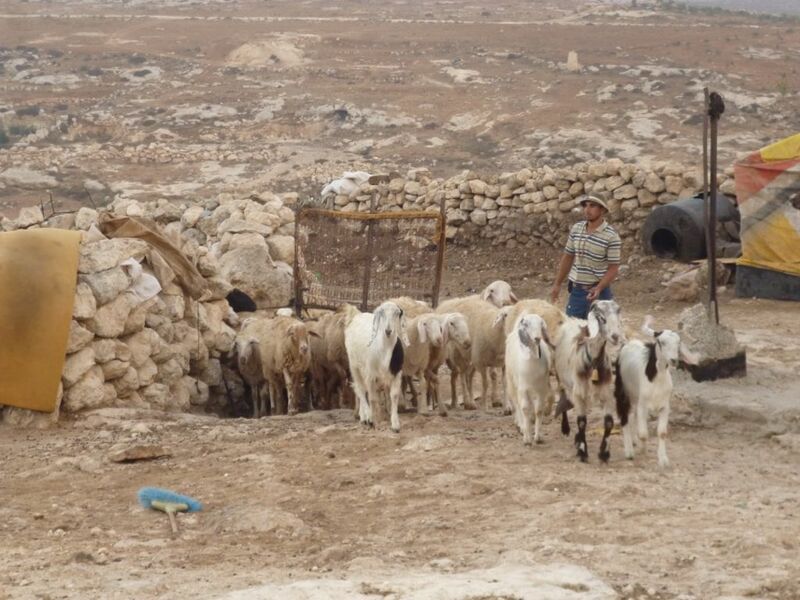 I have seen these shepherds before on another day, one is particularly keen on singing as he goes and his voice is heard singing folk songs, some Ta’ayush members join in – remember they are Jewish people and speak both Hebrew and Arabic. An EA gets out his flute and the army gazes on. After a while the sheep are finished and we make to go back to the village. The Army move their vehicles, the only communication between shepherd and army has been nonverbal. The army vehicles move to the hill above where the settlement is. It is a slow walk up the valley and slopes as the sheep are well fed. Then ahead appear two settlers both have guns and a large barking dog. The men both wear a white T-shirt a Ta’ayush woman tells me this is because it is the Sabbath. They move down the steep hill ahead of us. Out come all out cameras and we pass by then, up the next slope past the olive trees again to the village and sheep pens. We have been there four hours, 19 people have watched these sheep eat. The shepherds rest- later in the afternoon they will take their flocks out again this time to a field closer to the village. DISCLAIMER: I am participation in a programme with EAPPI as an Ecumenical Accompanier serving with the world council of churches in Ecumenical Accompanier Programme in Palestine and Israel . The views contained herein are personal to me and do not necessarily reflect those of my sending organization or the WCC. If you would like to publish the information contained here or distribute it further please first the EAPPI Communications and Advocacy officer (eappi.advocacy@gmail.com) for permission.